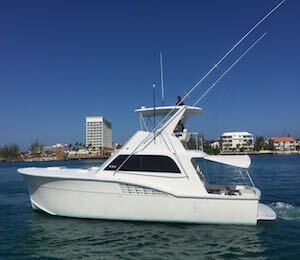 Join Captain Paul on this 48' Hatteras and enjoy an unforgettable day of fishing in luxury. This stylish charter can accommodate up to ten guests. Your friends or family will love this fully-equipped boat. It features air-conditioning, leading electronics, two staterooms, a full galley and head, and a bluetooth media system. We offer a half-day or full-day trip to work with your schedule. Whichever you choose, you will be sure to love cruising the sea in style. I have been to the Bahamas many times, but Inagua Salt -48' Hatteras is one of my favorite trips! It includes everything that everyone should do here. As a Bahamas veteran, I can say only the best about this experience!